Introducing a monthly column devoted to everyone's No. 1 concern. This new year will be a critical one for food safety. (Don't we say that every year?) The vigilance over keeping bugs out of the food supply never lets up, but there are a couple of things on the horizon that will make 2012 a watershed year. Before we get into those, let me introduce this column. 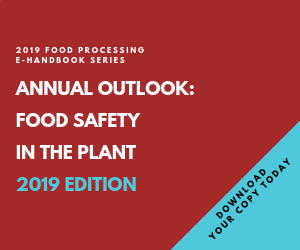 It's the first of what will be monthly looks at food safety, and from all kinds of angles: regulatory, ingredients, plant operations, software, even public relations. That's a lot of ground to cover, but this subject is as broad and multifaceted as it is important. Every year, in every survey we take – whether the respondents are from R&D, plant operations or management – food safety is the No. 1 concern. Back to the subject. The FDA and USDA, our two domestic governmental bodies in food safety enforcement, have busy agendas in the coming months. FDA will be consumed with the continuing implementation, and evolution, of the 2010 Food Safety Modernization Act. It was such a sweeping reform, the first major overhaul of the agency's powers in 70 years, that it will dominate the food safety landscape in the new year. But let me save the details for one more month. We'll do a deep-dive on that subject in February, when this column is penned by Eric Lindstrom, an attorney with Keller & Heckman, a law firm that specializes in regulatory issues and food safety. The FDA gave the industry a week-after-Christmas present. To help the food industry – especially small and medium processors — comply with upcoming preventive controls requirements of FSMA, the agency created the Food Safety Preventive Controls Alliance, in cooperation with the Illinois Institute of Technology's Institute for Food Safety and Health (IIT IFSH). It will develop training courses and materials on preventing contamination for both human and animal food during production. The alliance is composed of members from the FDA, local and state food protection agencies, the food industry and academia. It is funded by a one-year, $1 million grant. A year after nearly 2,000 salmonella infections were linked to eggs from an Iowa producer – and half a billion table eggs were recalled – the FDA is enforcing new egg rules, at least among the biggest egg producers. An FDA spokesperson told us developing preventive controls on farms would be an important part of the agency's enforcement of FSMA. That's partly because of the egg recall, partly due to last summer's outbreak of listeriosis linked to whole cantaloupes from Jensen Farms in Colorado. It was America's most deadly incidence of foodborne illness in a century, infecting 146 mostly elderly Americans in 28 states and killing 31 people plus a fetus. The FDA also has on its calendar a court-brokered commitment to decide by March 31 whether bisphenol A (BPA) is safe for food & beverage packaging. The issue has been hotly debated in recent years, and California banned the material last fall. In 2008, the Natural Resources Defense Council (NRDC) filed a petition with FDA requesting a ban on BPA in food packaging, food containers and any material likely to come in contact with food. When FDA did not respond, NRDC sued in 2010 asking the court to require the agency to respond. A Dec. 7, 2011, settlement reached in U.S. District Court for the Southern District of New York requires FDA to respond to NRDC's petition by March 31. BPA can be found in the linings of beer or soda cans, vegetable or soup cans and liquid infant formula containers as well as consumer products made from polycarbonate plastics, including reusable water bottles. Consumer demand has already driven baby bottles and sippy cups containing the chemical from store shelves. Of course, it's not just the FDA that's charged with American food safety. USDA applies its food safety policies closer to the farm, although it does regulate meat, poultry and seafood primary processing operations. As a result of some 2011 meat contamination incidents, ground beef will undergo more E. coli testing in 2012 with the addition of six more serotypes of the pathogen being declared as adulterants by USDA. The E. coli strain O157:H7 was banned in 1994, but there has been growing evidence that other strains are responsible for 40,000 illnesses, 1,100 hospitalizations and 30 deaths annually, according to the Centers for Disease Control and Prevention. The additional strains being banned from non-intact beef are E. coli O26, O45, O103, O111, O121 and O145. They're often referred to collectively as "the Big Six." It seems there's never a shortage of food safety stories. Nor any shortage of concern within the food & beverage industry for keeping products safe. So it seems a natural to devote this page to the subject every month. So turn to this page next month for the report on FSMA. And in March for a column on how to respond in the critical first 24 hours of a food safety crisis. We'd like to make this column and this subject interactive. Email me (dfusaro@putman.net) if you can suggest a topic for us to cover; also if you're a member of the food industry and would like to write on this topic. Together, perhaps we can make the food supply safer. Any food and beverage manufacturer who sells products in California can be sued. Agency finally rules  negatively  on 2008 petition from Natural Resource Defense Council. With HACCP plans already in place, dairies are on top of hazard control. Optical sorter helps L&S Cranberry pack quality fruit with no foreign material.